The Open Source Ecology – Afforestt Workshop is a 3 day immersion event in Extreme Afforestation. A forest planted by humans, then left to nature’s own devices, typically takes at least 100 years to mature. But what if we could make the process happen ten times faster? In this workshop, OSE is collaborating with TED Fellow and eco-entrepreneur Shubhendu Sharma of Afforestt in creating mini-forest ecosystems using an accelerated method. It’s based on the practices of Japanese forester Akira Miyawaki, as well as on Sharma’s own experiences gleaned from his former career in car manufacturing. We are collaborating with Afforestt in sharing and disseminating knowhow in ways to grow native, self-sustaining forests anywhere in the world, with the efficiency of industrial processes. We will plant a 2000 square foot Extreme Forest using the Miyawaki Method, and document the process carefully. 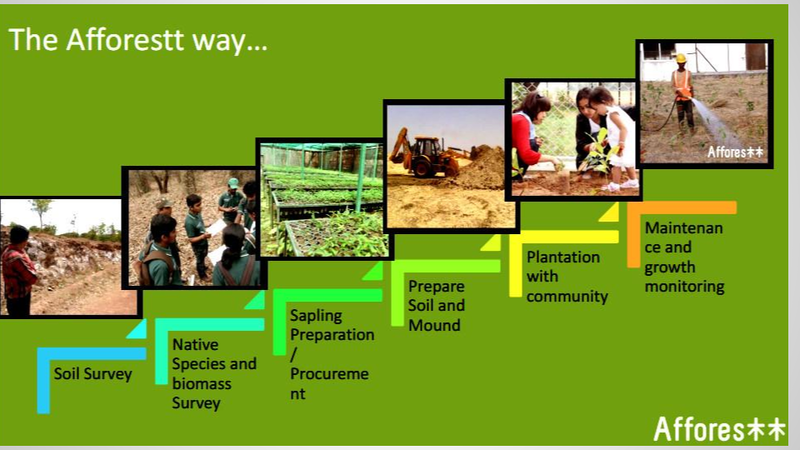 Participants will experience the process from start to finish, both in the philosophical underpinnings and in the practical skills for preparing and planting a forest. The complete workshop is 3 days, and begins with an exploration of afforestation entrepreneurship. Building upon the applied work of Afforestt, the seminal research of Dr. Miyawaki, the technology transfer of Open Source Ecology, the concept of the Open Source Nursery, learnings from the Miracle Orchard, and the ground-breaking work of woody plant breeding as done by Badgersett Research – we will begin mapping the business model and training program for replicable forestry and perennial crop enterprises. During the Afforestation Entrepreneurship Day – Afforestt and OSE are joining forces to open-source 3 afforestation business models. First is the owner operator model designed for a small business. Second is the workshop model, where immersion training workshops are held to do both an install and to train prospective afforestation entrepreneurs. Third is a larger Afforestation Hub designed as a federation of open source entrereneurs who can handle larger afforestation projects with more complex logistics. The intent of the workshopis to push the limits of perhaps the most conscious and conspicuously productive effort that any human can undertake: planting trees. Workshop immersion involves concept and practice, and includes a crash course on the Miyawaki Method, OSE’s machines and Extreme Build concepts, and Afforestt’s vision for afforestation as a new industry. Participants become engaged in a part of OSE’s development process, where we produce open source blueprints for the infrastructures of civilization. Participants are introduced to basic principles of collaborative literacy – how the collaborative mindset can be used to solve wicked problems. This specific workshop will use Open Source Ecology’s open source Tractor, Backhoe, and MicroTractor – 3 of the 50 machines of the Global Village Construction Set. This workshop is intended for people interested in immersion, hands-on skills training and practical results. This immersion course may be especially useful to people who would like to master their own livelihood as responsible stewards of the land. We are especially seeking participants with an entrepreneurial mindset to expand the afforestation movement far beyond the work of OSE and Afforestt alone. We are inviting those individuals who are interested in planting micro-forests or taking on bigger afforestation projects – which can be applied on any scale from 1000 square feet and up. We are also explicitly calling out social entrepreneurs interested in starting afforestation enterprises. OSE’s and Afforestt’s goal is to create open, collaborative, ethical enterprise ecosystems. OSE is particularly interested in developing open Working Teams and Open Source Consortia for bringing regenerative enterprise into the marketplace. Afforestt is interested in creating a platform that makes it easy for afforestation to happen, while being financially self-sufficient so afforestation has a chance to scale. To help spread this work, we are also inviting dedicated documenters and videographers to participate in the documentation track of the event. Weekend Immersion Workshop (Sep 4-6): Learn, Plant, and Get Skills. Enterprise Track (Sep 4): Step up to the social enterprise aspects of afforestation. Documentation Track (Sep 4-6): Document for replicability. The Enterprise Track is designed specifically for those who are considering starting an afforestation enterprise. The documentation track involves people who do not participate in the activities, but take notes, pictures, video, and b-roll – and should have their own video camera. The documentation is intended to be used for instructional guides and videos to spread the knowledge. As a bonus, we are also screening a pre-release of a documentary film on one of OSE’s collaborations on the tractor and urban gardening – Reversing the Mississippi. Shubhendu Sharma – Eco-entrepreneur Shubhendu Sharma — and his company, Afforestt — create afforestation methods that make it easy to plant maintenance-free, wild and biodiverse forests. Shubhendu is a TED Fellow and Ashoka Fellow, dedicated to restoring the world’s wild and highly biodiverse forests using specialized afforestation methodology, research, and cutting-edge technologies. He is interested in creating not only individual forests, but also in creating an entire new afforestation industry. See Afforestt in the Press. 2PM: Creating an Open Source Operations Manual for Afforestry. 7:30-9PM: Movie Night Bonus – Reversing the Mississippi – a pre-release screening of a documentary on the collaboration and tractor build with OSE and the Our School at Blair Grocery projects. 1-5PM: Afternoon Session. Finishing, documentation, and monitoring. Sponsor another participant: Sponsor $600 or $400 to fund attendance of someone who is on the waiting list for financial assistance. Group Rate: If you can bring a group of 3 or more people including you – we can give you a discount. Workshop fee includes workshop tuition. We can pick you up from the airport, Kansas City International (about an hour away). Participants may secure a hotel in Cameron, Missouri, (15 miles away). Participants are also welcome to camp at Factor e Farm. We have a camping location which includes a composting toilet. Showers and a bathroom are located in our main house, HabLab. Meals will be done as a combination of catered dinner and potluck lunch. For lunch – bring your own or bring some to share. OSE will provide continental breakfast and make-your-own sandwiches for lunch. A kitchen is available for basic food preparation. We also have a swimming pool that is open during daylight hours for relaxation. Registration for the choices above is found on Eventbrite, but Eventbrite accepts only PayPal or Credit Card. If you would like to pay by other means you can select that option at Eventbrite, but then you have to submit your payment independently of Eventbrite. We accept Dwolla, Bitcoin, Check, Money Order, or Cash. Your registration will be confirmed upon receipt of payment. Please make checks payable to Open Source Ecology. Our mailing address is OSE, 909 SW Willow Rd, Maysville, MO 64469. For mailings, please write “Gasifier Workshop” along with number of days on your instrument of payment. If for any reason you can’t attend a workshop you registered for we will be happy to (a) transfer you credit towards another Gasifier workshop in the future; (b) or equivalent credit towards any other other OSE workshop; (c) substitute the name on your ticket and have a friend take your place. I emailed you all a couple days ago but I am not sure my message sent properly. I am on SSDI and only receive $986 a month. None of our priests receive a salary and we serve the poorest of the poor so we don’t really have collections either. I want to do work Exchange. I might get paid early but I will definitely have my fee on 9/1. Will that be too late to pay? Could you please call me at 614.917.3337 and let me know because I don’t want to miss this conference. I will email the open-source ecology.org email address as well please pardon any redundancy this may cause. Am a retired person 58 years old and the area I stay in is devoid of trees. Wish I could learn your technology and create a forest in short span of 2 years. Let me know how to proceed. Do you hold workshops in India? I live in The city of Pune in Maharashtra State India. Our state is undergoing a severe drought so would like to Participate and learn .We need to get a Programme like yours out to the villages.Hundreds of Farmers have committed suicide. I have a 5000 sqft plot of land in the city and would like to afforest 1000 sqfeet as soon as possible. Yes, contact Afforestt in India. OSE is doing a CEB brick press build this August in India. Hey Rita, Did you start this initiative. I too stay in Pune & would like to help.